"Plough" and "Furrow" redirect here. 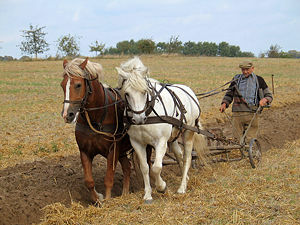 The traditional way: a German farmer works the land with horses and plow. The plow (British spelling plough) is a tool used in farming for initial cultivation of soil in preparation for sowing seed or planting. It has been a basic instrument for most of recorded history and represents a major advance in agriculture. The primary purpose of plowing is to turn over the upper layer of the soil, bringing fresh nutrients to the surface, while burying weeds and the remains of previous crops, allowing them to break down. It also aerates the soil, and allows it to hold moisture better. In modern use, a plowed field is typically left to dry out, and it is then harrowed before planting. Plows were initially pulled by oxen, and later in many areas by horses. In industrialized countries, the first mechanical means of pulling a plow used steam-power (plowing engines or steam tractors), but these were gradually superseded by tractors powered by internal combustion engines. Special plows have been used under the sea, to lay cables and to prepare the earth for side-scan sonar in a process used in oil exploration. Plowing, however, may dramatically increase the rate of soil erosion by wind and water. To limit soil damage and erosion, plow usage has decreased in some areas in the past two decades. It has been replaced by shallower plowing and other less invasive tillage techniques. A plow in action in South Africa. Notice the soil being turned over. In English, as in other Germanic languages, the plow was traditionally known by other names, such as the Old English sulh, Old High German medela or huohili, and Old Norse arðr. The current word plow also comes from Germanic, but it appears relatively late (it is absent from Gothic), and is thought to be a loanword from one of the north Italic languages. In these it had different meanings: in Raetic plaumorati (Pliny), and in Latin plaustrum "wagon, cart," plóstrum, plóstellum "cart," and plóxenum, plóximum "cart box". The word first appears in Germanic as Lombardic plóvum. This term was borrowed into Balto-Slavic languages, such as Old Church Slavonic plugъ and Lithuanian plúgas. Ultimately, the word is thought to derive from an ancestral PIE *blōkó, related to Armenian pelem "to dig" and Welsh bwlch "gap, notch". When agriculture was first developed, simple, hand-held digging sticks or hoes were likely to be used in highly fertile areas, such as the banks of the Nile where the annual flood rejuvenates the soil, to create furrows in which seeds could be sown. To grow crops regularly in less fertile areas, the soil must be turned to bring nutrients to the surface. The domestication of oxen in Mesopotamia and by its contemporary Indus valley civilization, perhaps as early as the sixth millennium B.C.E., provided mankind with the pulling power necessary to develop the plow. The very earliest plow was the simple scratch-plow, or ard, which consists of a frame holding a vertical wooden stick that was dragged through the topsoil (still used in many parts of the world). It breaks up a strip of land directly along the plowed path, which can then be planted. Because this form of plow leaves a strip of undisturbed earth between the rows, fields are often cross-plowed at right angles, and this tends to lead to squarish fields In the archeology of northern Europe, such squarish fields are referred to as "Celtic fields." The Greeks apparently introduced the next major advance in plow design: the crooked plow, which angled the cutting surface forward, leading to the name. The cutting surface was often faced with bronze or (later) iron. Metal was expensive, so in times of war it was melted down or forged to make weapons – or the reverse in more peaceful times. This is presumably the origin of the term "beat your swords to plowshares." 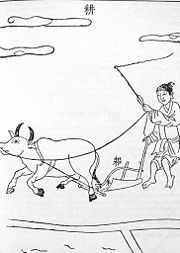 Plowing with oxen. 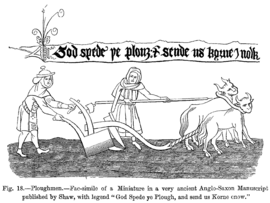 A miniature from an early sixteenth-century manuscript of the Middle English poem God Spede ye Plough, held at the British Museum. A Chinese iron plow with curved moldboard, 1637. A major advance in plow design was the moldboard plow (British spelling mouldboard plough), which aided the cutting blade. There are five major parts of a moldboard plow: moldboard, share, landside, frog, and tailpiece. The coulter, knife, or skeith cuts vertically into the ground just ahead of the share (or frog) a wedge-shaped surface to the front and bottom of the moldboard with the landside of the frame supporting the below-ground components. The upper parts of the frame carries (from the front) the coupling for the motive power (horses), the coulter and the landside frame. Depending on the size of the implement, and the number of furrows it is designed to plow at one time, there is a wheel or wheels positioned to support the frame. In the case of a single-furrow plow there is only one wheel at the front and handles at the rear for the plowman to steer and maneuver it. When dragged through a field, the coulter cuts down into the soil and the share cuts horizontally from the previous furrow to the vertical cut. This releases a rectangular strip of sod that is then lifted by the share and carried by the moldboard up and over, so that the strip of sod (slice of the topsoil) that is being cut lifts and rolls over as the plow moves forward, dropping back to the ground upside down into the furrow and onto the turned soil from the previous run down the field. Each gap in the ground where the soil has been lifted and moved across (usually to the right) is called a furrow. The sod that has been lifted from it rests at about a 45 degree angle in the next-door furrow and lies up the back of the sod from the previous run. In this way, a series of plowing runs down a field (paddock) leaves a row of sods that lie partly in the furrows and partly on the ground lifted earlier. Visually, across the rows, there is the land (unplowed part) on the left, a furrow (half the width of the removed strip of soil) and the removed strip almost upside-down lying on about half of the previous strip of inverted soil, and so on across the field. Each layer of soil and the gutter it came from forms the classic furrow. The moldboard plow greatly reduced the amount of time needed to prepare a field, and consequently allowed a farmer to work a larger area of land. In addition, the resulting pattern of low ridges (under the moldboard) and high ridges (next to it) in the soil forms water channels, allowing the soil to drain. In areas where snow buildup is an issue, this allows the soil to be planted earlier as the snow runoff is drained away more quickly. A runner extending from behind the share to the rear of the plow controls the direction of the plow, because it is held against the bottom land-side corner of the new furrow being formed. The holding force is the weight of the sod, as it is raised and rotated, on the curved surface of the moldboard. Because of this runner, the moldboard plow is harder to turn around than the scratch plow, and its introduction brought about a change in the shape of fields—from mostly square fields into longer rectangular "strips" (hence the introduction of the furlong). An advance on the basic design was the plowshare, a replaceable horizontal cutting surface mounted on the tip of the moldboard. Introduced by the Celts in Britain around 400 B.C.E. (without the replaceable feature), early moldboards were basically wedges that sat inside the cut formed by the coulter, turning over the soil to the side. The plowshare spread the cut horizontally below the surface, so when the moldboard lifted it, a wider area of soil was turned over. In the basic moldboard plow, the depth of the cut is adjusted by lifting against the runner in the furrow, which limited the weight of the plow to what the plowman could easily lift. This limited the construction to a small amount of wood (although metal edges were possible). These plows were fairly fragile, and were unsuitable for breaking up the heavier soils of northern Europe. The introduction of wheels to replace the runner allowed the weight of the plow to increase, and in turn allowed the use of a much larger moldboard faced in metal. These heavy plows led to greater food production and eventually a significant population increase around 600 C.E. Heavy iron plows were invented in Han Dynasty China around 100 B.C.E. Despite a number of innovations, the Romans never achieved the heavy wheeled moldboard plow. The first indisputable appearance after the Roman period is from 643, in a northern Italian document. Old words in connected with the heavy plow and its use appear in Slavic, suggesting possible early use in this region The general adoption of the moldboard plow in Europe appears to have accompanied the adoption of the three-field system in the later eighth and early ninth centuries, leading to an improvement of the agricultural productivity per unit of land in northern Europe. Research by the French historian Marc Bloch in medieval French agricultural history showed the existence of names for two different plows, "the araire was wheel-less and had to be dragged across the fields, while the charrue was mounted on wheels". The basic plow with coulter, ploughshare, and moldboard remained in use for a millennium. Major changes in design did not become common until the Age of Enlightenment, when there was rapid progress in design. The Dutch are credited with the introduction of newer shapes for the moldboard in the 1600s, although these shapes were known earlier in China and may have been discovered by the Dutch while there. 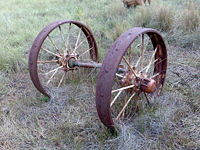 A pair of metal wheels from a plow on a farm near Dordrecht, Eastern Cape. Joseph Foljambe in Rotherham, England, in 1730 used these new shapes as the basis for the Rotherham plow, which also covered the moldboard with iron. Unlike the heavy plow, the Rotherham (or Rotherham swing) plow consisted entirely of the coulter, moldboard, and handles. It was much lighter than conventional designs and became very popular in England. It may have been the first plow to be widely built in factories. James Small further improved the design. Using mathematical methods he experimented with various designs until he arrived at a shape cast from a single piece of iron, the Scots plow. This was again improved on by Jethro Wood, a blacksmith of Scipio, New York, who made a three-part Scots plow that allowed a broken piece to be replaced. In 1837 John Deere introduced the first steel plow; it was much stronger than iron designs that it was able to work the soil in areas of the US that had earlier been considered unsuitable for farming. Improvements on this followed developments in metallurgy; steel coulters and shares with softer iron moldboards to prevent breakage, the chilled plow which is an early example of surface-hardened steel, and eventually the face of the moldboard grew strong enough to dispense with the coulter. Single-sided plowing in a plowing match. The first moldboard plows could only turn the soil over in one direction (conventionally always to the right), as dictated by the shape of the moldboard, and so the field had to be plowed in long strips, or lands. The plow was usually worked clockwise around each land, plowing the long sides and being dragged across the short sides without plowing. The length of the strip was limited by the distance oxen (or later horses) could comfortably work without a rest, and their width by the distance the plow could conveniently be dragged. These distances determined the traditional size of the strips: a furlong, (or "furrow's length," 220 yards (200 m)) by a chain (22 yards (20 m)) – an area of one acre (about 0.4 hectares); this is the origin of the acre. The one-sided action gradually moved soil from the sides to the centre line of the strip. If the strip was in the same place each year, the soil built up into a ridge, creating the ridge and furrow topography still seen in some ancient fields. The turnwrest plow allows plowing to be done to either side. The moldboard is removable, turning to the right for one furrow, then being moved to the other side of the plow to turn to the left (the coulter and plowshare are fixed). In this way adjacent furrows can be plowed in opposite directions, allowing plowing to proceed continuously along the field and thus avoiding the ridge and furrow topography. The reversible plow has two moldboard plows mounted back-to-back, one turning to the right, the other to the left. While one is working the land, the other is carried upside-down in the air. At the end of each row, the paired plows are turned over, so the other can be used. This returns along the next furrow, again working the field in a consistent direction. Early steel plows, like those for thousands of years prior, were walking plows, directed by the plowman holding onto handles on either side of the plow. The steel plows were so much easier to draw through the soil that the constant adjustments of the blade to react to roots or clods was no longer necessary, as the plow could easily cut through them. Consequently it was not long after that the first riding plows appeared. On these, wheels kept the plow at an adjustable level above the ground, while the plowman sat on a seat where he would have earlier walked. Direction was now controlled mostly through the draft team, with levers allowing fine adjustments. This led very quickly to riding plows with multiple moldboards, dramatically increasing plowing performance. A single draft horse can normally pull a single-furrow plow in clean light soil, but in heavier soils two horses are needed, one walking on the land and one in the furrow. For plows with two or more furrows more than two horses are needed and, usually, one or more horses have to walk on the loose plowed sod—and that makes hard going for them, and the horse treads the newly plowed land down. It is usual to rest such horses every half hour for about ten minutes. Heavy volcanic loam soils, such as are found in New Zealand, require the use of four heavy draft horses to pull a double-furrow plow. Where paddocks are more square than long-rectangular it is more economical to have horses four wide in harness than two-by-two ahead, thus one horse is always on the plowed land (the sod). The limits of strength and endurance of horses made greater than two-furrow plows uneconomic to use on one farm. Amish farmers tend to use a team of about seven horses or mules when spring plowing and as Amish farmers often help each other plow, teams are sometimes changed at noon. Using this method about ten acres can be plowed per day in light soils and about 2 acres (8,100 m²) in heavy soils. Plowing engine Heumar, made by the Ottomayer company (Germany), used in pairs with a balance plow. Built 1929, 220 PS, 21 tons. The advent of the mobile steam engine allowed steam power to be applied to plowing from about 1850. 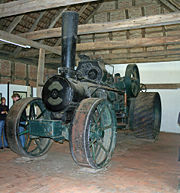 In Europe, soil conditions were too soft to support the weight of the heavy traction engines. Instead, counterbalanced, wheeled plows, known as balance plows, were drawn by cables across the fields by pairs of plowing engines which worked along opposite field edges. The balance plow had two sets of plows facing each other, arranged so when one was in the ground, the other set was lifted into the air. When pulled in one direction the trailing plows were lowered onto the ground by the tension on the cable. When the plow reached the edge of the field, the opposite cable was pulled by the other engine, and the plow tilted (balanced), the other set of shares were put into the ground, and the plow worked back across the field. One set of plows was right-handed, and the other left-handed, allowing continuous plowing along the field, as with the turnwrest and reversible plows. The man credited with the invention of the plowing engine and the associated balance plow, in the mid-nineteenth century, was John Fowler, an English agricultural engineer and inventor. In America the firm soil of the Plains allowed direct pulling with steam tractors, such as the big Case, Reeves or Sawyer Massey breaking engines. Gang plows of up to 14 bottoms were used. Often these big plows were used in regiments of engines, so that in a single field there might be ten steam tractors each drawing a plow. In this way hundreds of acres could be turned over in a day. Only steam engines had the power to draw the big units. When internal combustion engines appeared, they had neither the strength nor the ruggedness compared to the big steam tractors. Only by reducing the number of shares could the work be completed. 'Disc Plows' in Australia, circa 1900. The Stump-jump plow was an Australian invention of the 1870s, designed to cope with the breaking up of new farming land, that contains many tree stumps and rocks that would be very expensive to remove. The plow uses a movable weight to hold the plowshare in position. When a tree stump or other obstruction such as a rock is encountered, the plowshare is thrown upwards, clear of the obstacle, to avoid breaking the plow's harness or linkage; plowing can be continued when the weight is returned to the earth after the obstacle is passed. A simpler system, developed later, uses a concave disc (or a pair of them) set at a large angle to the direction of progress, that uses the concave shape to hold the disc into the soil – unless something hard strikes the circumference of the disk, causing it to roll up and over the obstruction. As the arrangement is dragged forward, the sharp edge of the disc cuts the soil, and the concave surface of the rotating disc lifts and throws the soil to the side. It doesn't make as good a job as the moldboard plow (but this is not considered a disadvantage, because it helps fight the wind erosion), but it does lift and break up the soil. Modern plows are usually multiple reversible plows, mounted on a tractor via a three-point linkage. These commonly have between two and as many as seven moldboards – and semi-mounted plows (the lifting of which is supplemented by a wheel about half-way along their length) can have as many as eighteen moldboards. The hydraulic system of the tractor is used to lift and reverse the implement, as well as to adjust furrow width and depth. The plowman still has to set the drafting linkage from the tractor so that the plow is carried at the proper angle in the soil. This angle and depth can be controlled automatically by modern tractors. 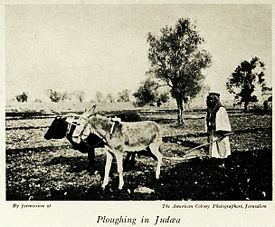 A farmer plows his fields in Judea, 1913. On modern plows and some older plows, the moldboard is separate from the share and runner, allowing these parts to be replaced without replacing the moldboard. Abrasion eventually destroys all parts of a plow that contact the soil. A modern John Deere 8110 Farm Tractor using a chisel plow. The chisel plow is a common tool to get deep tillage with limited soil disruption. The main function of this plow is to loosen and aerate the soils while leaving crop residue at the top of the soil. This plow can be used to reduce the effects of compaction and to help break up plowpan and hardpan. Unlike many other plows the chisel will not invert or turn the soil. This characteristic has made it a useful addition to no-till and limited-tillage farming practices which attempt to maximize the erosion-prevention benefits of keeping organic matter and farming residues present on the soil surface through the year. Because of these attributes, the use of a chisel plow is considered by some to be more sustainable than other types of plow, such as the moldboard plow. The chisel plow is typically set to run up to a depth of eight to twelve inches (200 to 300 mm). However some models may run much deeper. Each of the individual plows, or shanks, are typically set from nine inches (229 mm) to twelve inches (305 mm) apart. Such a plow can encounter significant soil drag, consequently a tractor of sufficient power and good traction is required. When planning to plow with a chisel plow it is important to bear in mind that 10 to 15 horsepower (7 to 11 kW) per shank will be required. A ridging plow is used for crops, such as potatoes, which are grown buried in ridges of soil. A ridging plow has two moldboards facing away from each other, cutting a deep furrow on each pass, with high ridges either side. The same plow may be used to split the ridges to harvest the crop. The mole plow or subsoiler allows underdrainage to be installed without trenches, or it breaks up deep impermeable soil layers which impede drainage. It is a very deep plow, with a torpedo-shaped or wedge-shaped tip, and a narrow blade connecting this to the body. When dragged through the ground, it leaves a channel deep under the ground, and this acts as a drain. Modern mole plows may also bury a flexible perforated plastic drain pipe as they go, making a more permanent drain – or they may be used to lay pipes for water supply or other purposes. Foremost was the control of weeds. In this function, moldboard plowing is very successful, a farmer can control weed growth with far fewer herbicides by using this technique than is otherwise possible with any other method, aside from hand weeding, which is labor-intensive and not practical for large operations. Only the first reason for moldboard plowing really paid off. Most plants require little soil agitation to germinate, so breaking up soil is unnecessary beyond what a planting implement accomplishes on its own. Soil warming is also unnecessary beyond two or three inches (76 mm) below the surface, therefore bringing black fresh soil which heats more quickly and more deeply after the final frost of the year is unneeded. Moldboard plowing has become increasingly recognized as a highly destructive farming practice with the possibility of rapidly depleting soil resources. In the short term, however, it can be successful, hence the reason it was practiced for such a long time. A field that is moldboarded once will generally have an extraordinary one time yield as the larvae of pests and seed from weeds are buried too deeply to survive. After the first harvest, however, continued moldboarding will diminish yields greatly. Foremost is the formation of hardpan, or the calcification of the sub layer of soil. In some areas, hardpan could once be found so thick it could not be broken up with a pickaxe. The only effective means of removing hardpan is using a "ripper," or chisel plow, which is pulled through the hardpan by an extremely powerful and costly tractor. Obviously, this layer eventually becomes impenetrable to the roots of plants and restricts growth and yields. This layer also becomes impenetrable to water, leading to flooding and the drowning of crops. Deep (> 15-20 cm) moldboard plowing rapidly depletes the organic matter content of soil and promotes erosion; these two problems go hand in hand. As soil is brought to the surface, the root structure of the previous harvest is broken up, and the natural adhesion of soil particles is also lost; though loose soil appears good for plant germination (and it is), this loose soil without cohesion is highly susceptible to erosion, multiplying the rate of erosion by several factors compared to a non-moldboarded plot. This increased rate of erosion will not only outpace the rate of soil genesis but also the replacement rate for organics in the soil, thus depleting the soil more rapidly than normal. Deep (> 15-20 cm) moldboard plowing leads to increased soil compaction and loss of pore space within the soil. Soil is a bit like a bucket full of balls filled with sand. Each ball represents a cohesive particle of soil, and when stacked the balls leave a great deal of air space, required for healthy root growth and proper drainage. Moldboarding so disturbs the soil that it breaks these balls and releases their contents. When this happens, the much smaller particles that are within the larger particles are released and pore space diminishes, leading to hard compacted soil that floods easily and restricts root growth. One negative effect of plowing is to dramatically increase the rate of soil erosion, both by wind and water, where soil is moved elsewhere on land or deposited in bodies of water, such as the oceans. Plowing is thought to be a contributing factor to the Dust Bowl in the US in the 1930s. Alternatives to plowing, such as the no till method, have the potential to limit damage while still allowing farming. ↑ C.T. Onions, (ed.) 1996. "Plow." Oxford Dictionary of English Etymology. (Oxford, UK: Clarendon Press. ISBN 9780198611127). ↑ Vladimir Orel, 2003. "PlôZuz." A Handbook of Germanic Etymology. (Leiden, NL: Brill. ISBN 9781417536429). ↑ Lynn White, Jr. 1962. Medieval Technology and Social Change. (Oxford, UK: Oxford University Press), 42. ↑ Marc Bloch and Janet Sondheimer (trans.) 1966. French rural history an essay on its basic characteristics. (London, UK: Routledge & Paul), 50. ↑ Robert K.G. Temple, and Joseph Needham. 1998. The Genius of China: 3,000 Years of Science, Discovery, and Invention. (London, UK: Prion Books Limited), 16–20. ↑ Alan Jones, A Brief History of The Plough. Ploughmen.co.uk. Retrieved November 16, 2008. ↑ John Deere (1804–1886). About.com. Retrieved November 16, 2008. ↑ NO-TILL FARMING OFFERS A QUICK FIX TO HELP WARD OFF HOST OF GLOBAL PROBLEMSResearch News Ohio State University. Retrieved December 2, 2008. Bloch, Marc, and Janet Sondheimer (trans.). 1966. French rural history an essay on its basic characteristics. London, UK: Routledge & Paul. Halberstadt, April, and Hans Halberstadt. 1997. Plows & Planting Implements. Osceola, WI: Motorbooks international Publishers & Wholesalers. ISBN 0760300992. Orel, Vladimir. 2003. "PlôZuz." A Handbook of Germanic Etymology. Leiden, NL: Brill. ISBN 9781417536429. Ruddiman, William F. 2007. Plows, Plagues, and Petroleum: How Humans Took Control of Climate. Princeton, NJ: Princeton University Press ISBN 0691133980. Temple, Robert K.G., and Joseph Needham. 1998. The Genius of China: 3,000 Years of Science, Discovery, and Invention. London, UK: Prion Books Limited. ISBN 1853752924. White, Lynn, Jr. 1962. Medieval Technology and Social Change. Oxford, UK: Oxford University Press. ISBN 0195002660. This page was last modified on 29 March 2019, at 21:44.